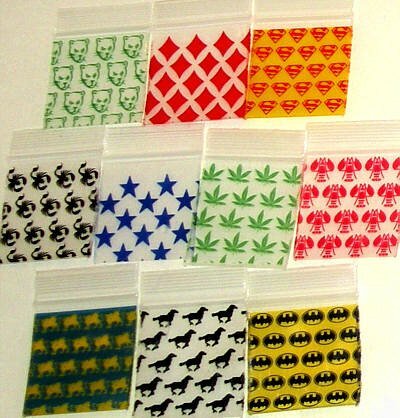 200 Mixed Designs, 1.5 x 1.5" Small Ziplock Bags 1515. Ten different designs, randomly selected from available stock. The photo is a representative sample. Size is usable inside size. Genuine Apple Brand Ziplock bag, thicker and stronger than the 2 mil bags many other sellers offer. 200 Green Leaves Baggies Small Ziplock Bags 0.5 x 0.5"